The idea of putting everything on your cell phone does strike me as pathetic (also lazy); more importantly, it’s ridiculously risky. I don’t want my phone to be a sort of mega-remote. This is partly because devices that do everything don’t really do anything that well, if only because of clutter (I have enough real clutter, and don’t need the virtual version) and partly because if I lose my phone I have enough to worry about as it is, with all that personal information on there; I don’t want a perfect stranger defrosting my freezer into the bargain. Or worse, using my virtual door key to get into my home and actually seeing what’s in my freezer. At this point I don’t even know what some of that stuff is, apart from a growth medium for ice crystals. So I agree with Negroponte’s criticism of the conflation of “smart” with mobile. However, his talking oven also gives me a wiggins, and not just because it apparently not only knows his name but refers to itself in the third person: “it’s cooking the chicken for Nicholas”? Ok, I know this is a transcribed speech, so that sounds like I am just being petty about a grammatical lapse, but I am a neo-Freudian and we don’t believe that real people have accidents of this kind. The pronoun problem is indicative of a larger issue: a problem of displaced consciousness and agency. But to get back to those neo-Freudian preoccupations: take a minute and listen to Negroponte’s voice when the talking oven enters the story (you can skip to that point in the TED video very easily by going to the Interactive Transcript and clicking on the relevant paragraph, at 9 minutes 54 seconds). He is an accomplished and experienced speaker, and like many educators has an arsenal of gestures and intonations at his disposal. So his dialogue for the smart appliance is animated, hyper-expressive, and slightly laced with irony: he knows the talking oven is funny. But the way his vocal pitch goes up, the expansion of certain key phonemes, mark this little section of narrative as high fantasy. He sounds like a very serious person reading a fairy-tale to children. The oven that knows just what Nicholas wants, and cooks it just right: we are in the Land of Cockaigne. In the late 16th century (the 1560’s, to be more precise), the Flemish painter Pieter Bruegel the Elder illustrated the medieval concept of a land of unearned plenty; the image above, “The Land of Cockaigne,” is Bruegel’s critique of this fantasy. Apparently the painter liked roast chicken too, for one of the animated foodstuffs haunting this scene is a living cooked bird, laying its head down upon a platter presumably in preparation for offering itself to be eaten. But the five humans in the picture don’t seem to notice this act of self-sacrifice; of the three who are awake, two are waiting open-mouthed for food and drink to drop in, while in the background the third is burrowing his way head-first into a huge blob of something nondescript (one can only hope it is pudding). In the land of “smart foodstuffs,” human activity is either unnecessary or disturbingly regressive; the monstrous pudding envelopes and devours the diner. And agency — purposive and self-constitutive action — is carried out by objects, while subjects remain passive or submerged. Bruegel’s objection is not, I would argue, mere early-modern ascetic scolding. The edible world in fairy-tales is inevitably a trap, the witch’s candy hut in “Hansel and Gretel” that entices children who will in turn be fattened for the oven. Hardly a coincidence that Negroponte chooses to invest with a voice this appliance, with its promise of the psychic turnaround play so typical of early childhood fears: the source of food becomes the devouring entity that yawns and beckons. The talking oven knows exactly what Nicholas wants to eat and how he wants it, but the underlying threat is always there: turning the world “this way and that way,” the smart device carries the potential for sinister reversals and hidden thoughts. I’m not arguing here that the oven that can cook a chicken will one day become conscious and decide to cook me. I like my smartphone just fine, and I don’t think it plans to take over the world. Artificial intelligence is to my mind the ultimate Cockaigne fantasy; machines cannot think, because they cannot dream. They can only mimic the most basic and rule-bound thought processes, and no mere number of connections or calculations can change that. 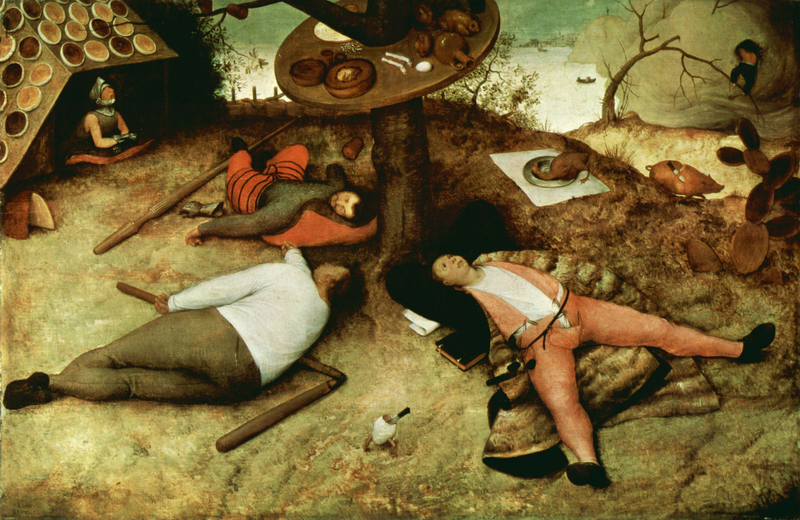 What does bother me is the human tendency Bruegel so cleverly illustrates: conservation of effort. If we can save an hour by microwaving something that tastes like cardboard, many of us will pay a premium price for that “convenience,” even if it fills our stomachs with chemical stabilizers and processed ingredients. Middle-class American adults have less leisure time than their nineteen-seventies counterparts, and many of their less-privileged compatriots can’t afford decent food for their kids anyway. So the oven that cooks for us, even if it can’t do it well or if the chicken has to be “stabilized” first, may have a future. And it will give us exactly what we want, because we won’t have experienced the real thing. We will settle, the way we have already settled for appliances that break more easily than the old models, for compressed music that only sounds like anything if we play it too loud, for fast-food and vending machine calories. In the process we are fattened for the oven of non-stop work and every-minute shopping that our devices have placed at our fingertips. The dream of every wish being fulfilled without effort, Freud argues, is a necessary part of childhood, and fantasy is a serious part of being human; but it can also entrap us in the form of the Death Wish — the desire for a world in which the subject need not act, where every object is instantaneous and imaginary, and real desire never exists because no longing endures. Caught in this endless dream, the subject starves amid imagined plenty. So when someone like Nicholas Negroponte tells us that the Internet of Things will be cooking in our kitchens some day soon — and in the context of a speech where he points out his own track record as a predictor of tech to come — maybe we should start thinking: before we enter the Land of Cockaigne, what kind of work should we reserve for ourselves? *Shake-a-Pudd’n was a powdered mix that when combined with water and shaken made a vaguely gelatinous mass of sugary snack food. It was discontinued, probably because it consisted almost entirely of stuff no-one could pronounce. Psuedo-food like this went to the Moon, or could have, which was its real charm.
. . . the shift from hierarchy to heterarchy, which is still in progress worldwide. (‘Heterarchy’ was coined by early cybernetician Warren McCulloch at MIT to designate networked structures in which the center of control constantly moves to whatever is most relevant and useful; he was thinking of brain function.) (“We Are as Gods,” Fall 1968). Originally designed to promote what is now called “maker” culture by recommending inexpensive “tools” that could be mail-ordered, The Whole Earth Catalog soon expanded to include reader-submitted materials, thus coming to resemble some early modern periodicals (in new media, content types have a fairly predictable cycle). It also made the move to electronic formats relatively early, thanks both to Brand’s involvement with the WELL and to sponsorship from Apple. While Brand is currently a divisive figure in environmentalist circles – he has endorsed nuclear “microreactors” and genetic and geo-modification as essential for human survival (see his TED talk from June 2009) – his use of mass media has consistently been utopian in vision and goals. Brant’s newer project, The Long Now Foundation, among other campaigns supports “genetic rescue for endangered and extinct species” (“Revive and Restore”) and “The Rosetta Project,” an attempt to archive “ALL Documented Human Languages.” However, the main function of the Long Now web site appears to be marketing memberships, which entitle users to access a TED-like system of live talks and digital archives. Typically, Brand has moved from selling a print “catalog” of tools and essays to monetizing a digital version of the same sort of curated collection. While this campaign was formally announced in 2013, its thematics are clearly stated in the 2010 film 180 Degrees South: Conquerors of the Useless, which details Chouinard’s and Doug Tompkins’ purchase for preservation of undeveloped land in South America. The 180 of the title refers to an image that recurs in The Whole Enchilada: we are walking towards a cliff, and need to turn around. In the context of a company devoted from its beginnings to climbing, this image resonates strongly and synergistically, emphasizing the overall consistency of Patagonia’s rhetorical strategies. Finally, a relative newcomer on the scene is Blake Mycoskie’s TOMS company, which matches customer purchases with donations to “communities in need around the world.” Now celebrating its eighth year, TOMS has branched out from its original product line, shoes, to include eyewear (customer purchases fund vision programs) and coffee (matched with “safe water solutions”). Having established itself primarily online, TOMS has just issued its first print catalog, entitled “Vagabond Journal.” This publication features snapshot-style photographs of the TOMS staff traveling and modeling the product line, as well as invitations to “Hang with us on Instagram” and “Explore our travel diary at TOMS.com/stories.” Like Chouinard, Mycoskie explicitly represents his company’s goal in terms of connecting capitalism and global responsibility, and both companies’ print and online catalogs minimize images of product while combining narrative text, “non commercial” photographic images, and the interpolation of customers through direct exhortations to action. Both companies also sponsor other, smaller producers they see as sharing their values. There are significant differences as well: representing a newer company designed to appeal to millenials, the TOMS catalogs seek to expand their media range by emphasizing the visual “languages” and devices of social media. While it has its own customer-oriented blog sites, Worn Wear and The Cleanest Line, Patagonia in its catalogs uses more traditional photo spreads (albeit submitted by or featuring “ambassadors” who appear to combine photographic talents with enviable lives of adventure). The company’s catalog also emphasizes its “old media” chops in the form of feature-length video and book publications. Whole Earth, meanwhile, is now entirely an online creation, and its somewhat cranky web site is oddly recursive, reprinting and extoling its own history and a selection of key articles (members are allowed to purchase an expanded selection of materials as PDFs.). Let’s call Brand’s style a grandiose form of technofetishism. Patagonia tends to use the “big picture,” emphasizing natural beauty and human adventure. And TOMS? Utopian meta-community, with membership contingent on purchases, and the company’s representatives doing the travel for us. Have these different frameworks been, or could they be, effective in terms of their stated goals of transforming the future, reducing unfettered growth, and creating an economy of ethical consumption? Certainly Chouinard’s purchases of land and Mycoskie’s donations of shoes and funding for eye care can be seen as small but real contributions to ecology and social justice. Brand’s proposals to re-engineer extinct and endangered species are of more doubtful value, both because of their debated science (would a re-engineered passenger pigeon be a “real” specimen of its vanished kind or a chimerical vector for disease?) and because they partake of the more-is-better logic of the pure consumer catalog; one is tempted to compare the 10,000 clock, despite its gee-whiz charms, to the banana slicer. But I would like to put these more immediate practicalities aside in favor of a more theoretical question: to what degree do these “anti-catalog” projects function to subvert or deconstruct the whole discursive sphere of what Gibson and Sterling call “the sullen omnipresence of insistent words and images”? (DE 275). This broadsheet is an example of the print equivalent of, let’s say, a blog: inexpensive and relatively direct to produce, since content creators could hire printers (who were also booksellers) to make the prints, which were then hawked on the streets. The visual images typically were drawn from the printer’s repository of existing engravings that could be adapted or simply appropriated, and which drew on tropes familiar to non- or barely-literate buyers. The relationship of the image to the text is thus illustrative in the same sense that the photograph of “This Jacket” in the Patagonia ad represents a “real” jacket: it is a double metonymy. Let me unpack hat “double” part: the catalog image of an object is already a metonymy, since after all the buyer will not receive the exact object of the photograph; but in the Patagonia “Don’t Buy” ad the jacket pictured represents not merely the whole range of similar objects but the entire consumer enterprise we are urged to shun. It becomes an anti-object, a barred presence. 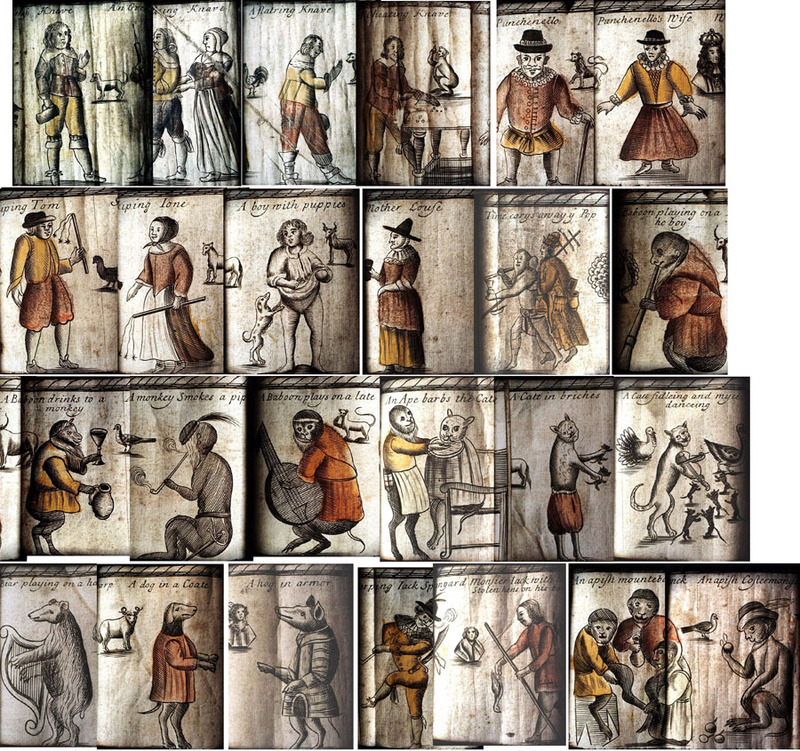 Similarly, the early modern audience for the “Sucklington faction” broadsheet surely knew that the image being marketed was not a true representation of a particular group; as Dr. Malcolm Jones, the resident expert for bpi1700, points out, the “fit” between image and text is clumsy at best. What the broadsheet does is force its immediate political object into the category represented by the image, that of the reckless and destructive “roaring boy.” It is an act of street theater, as subversive as the “devilish” false adverts that in The Difference Engine accompany and precipitate mass riots in an alternative-history steampunk 19th-century London. Of the three subjects of this essay, then, arguably Patagonia despite the acknowledged paradoxes of its anti-growth campaign is participating in a sort of theatrical usage of the mass media “public sphere”: a queering of the catalog that is potentially more radical than Stewart Brand’s techno-fetishism or even Blake Mycoskie’s utopian meta-community. Of these contemporary “catalogs,” Whole Earth has made the transition to an entirely online model, which fits its self-proclaimed identity/origin as “evaluation and access device” for ideas and mail-order “tools.” Patagonia has created the most diverse “footprint,” occupying multiple web sites, print catalogs, books, and videos (some of which are housed on external sites). And TOMS has made the jump from web-based to print media as it has become more successful. The pattern is encouraging, if only because it suggests a wide range of media engaging synergistically and creatively. Whether it is transformative or not remains to be seen. The “permanent” print catalog is reimagined as a formal object authenticated not by its resemblance to speech but by its difference from immediacy and desire. At the same time the web catalog, with its ethos of consumer inclusion, potentially becomes less about the endlessly evolving network of desirable objects it features and more about the qualities those objects represent – it takes on the modality of Derridean speech in terms of authenticity and “presence,” as a site where one’s “likes” are exchanged like the signifying and divinely useless objects of gift culture. If one of the intangibles this kind of catalog promotes is the desire for that most intangible of gifts, conservation, perhaps there is indeed still hope. If we’re buying it . . .
For the last few weeks I’ve been mulling over an unfinished (for me, at least) discussion in the New Media Faculty Seminar concerning what, in McLuhan’s terms, makes something a discrete medium. The only result of the aforementioned mulling process was that the overall question sprouted as many heads as the hydra, and I tabled it. However, a recent political event woke it up again: the refusal of the United States to endorse a new version of the long-standing international telecommunications treaty sponsored by the UN’s International Telecommunications Union, because members of the current group (led by Russia and including China) insisted on passing a companion resolution whose wording suggests “the Internet is a telecommunications service, . . . not, as the United States argued, a form of content” (“US Rejects Telecommunications Treaty”). The desire of some ITU members to include “the Internet” as telecommunications apparently stems from what these interests see as a need to regulate digital modes of communication; when they were unable to get the reference inserted into the actual treaty, they resorted to the resolution. The US and its allies, including Google, saw this as a threat to the free creation of digital speech. Of course, I have no illusions about the commercial aspects of US resistance to international oversight of the Internet (although the treaty itself seems to be relatively toothless). But it still struck me as the right move, not just for political reasons but because the definition of “the Internet” as a unique type of content seems theoretically sound. Digital communication is not simply another way to make a phone call, and the argument that it is “because Internet traffic travel[s] through telecommunications networks” makes about as much sense as saying that a runner is a car because she uses the public roads. So here’s where McLuhan comes in: the error would lie in assuming that the medium (the Internet) is the same as the storage/transmission system that houses it. It may be shaped by that system, just as the painter’s work is shaped by the choice of oils or watercolor, but the choice of instrument or pigment or mode of transmission is not the thing itself. Nor is it simply a product of the experience of those who see or read or hear it. In these terms, a traditional movie is the same object if I see it in a theater or watch it on my computer; a recorded song is the same when I play it on my stereo or rip it to my iPod. I may experience some qualitative degradation, but I think in McLuhan’s theoretical framework that is irrelevant. McLuhan’s is not a pure reception-aesthetic, that is, it is not concerned with the variations between individual experiences of the same object (which is an inevitable consequence of the fact that we are different; even if we sit side by side at the same concert we each hear something unique). Instead, McLuhan describes the results of a communicative system, a global village, in which a sender (writer, painter, TV production crew, etc.) intentionally creates and transmits an object to a network of recipients. That object is not simply a content stuffed into a form, but rather from its completion a fusion of the two. What makes “the Internet” more than simply a new way to deliver more of the same is, I would argue, precisely what makes certain interests want to force it not to be itself: digital objects create or participate in creating new networks. On one level, this post you are now (I hope) reading resembles an example of the prose essay, but as a medium the blog is a hypertext, ready to be stumbled upon by anyone who enters the right terms in a search engine. It is also not in itself a commodity, although it can be monetized; it is subject to the ongoing inclusion in its paratexts of the comments of others; it is “published” on my timeline and at my whim; and it remains editable even once made public. My awareness of these fluid, dialogic traits informs my writing significantly. Many of the new digital modes — MOOCs, crowd-sourcing systems, sharing sites — represent an alternative culture that is also manifested in pop-up businesses, flash movements, and other types of network creation that typically use the immediacy, accessibility, and chattiness of digital media to spread the word. Politically speaking, such phenomena as the spontaneous charitable networks that have sprung up in response to disasters around the globe represent the best of this new culture: its awareness not only that it takes a village but that virtual villages can be built overnight, for a specific purpose. The US argument that the Internet represents a unique type of content, then, is justifiable precisely in that part of its content is the unique conversation it represents between creators and receivers. That this relation is a political one, and potentially empowering, seems obvious, and the US should continue to use its influence with the UN to support a differentiation that ultimately (and perhaps uniquely) serves both commercial and communal freedoms. Like McLuhan’s beloved advertisements, the Internet blurs the lines between commerce, art, and political speech — or perhaps reminds us that these lines were always tenuous at best. No, not me. This is about apps, specifically the iOS apps that I have learned to love and trust, and a few that are useful if sometimes irritating. The topic of specialization came up at this week’s New Media seminar, and it got me thinking about how specialized iPad apps have changed my relationship to writing and research, I think for the better. First, though I want to talk a little about my past experiences with writing on a device, which I think grounds my reaction to apps — but if that sort of thing bores you, skip the next three paragraphs. If anything qualifies me to talk — sorry, type — about this subject, besides my lifelong addiction to writing, it’s my age. I went to graduate school toting a portable manual typewriter that had been my grandfather’s. Not that electrics didn’t exist yet — I’m not that old, thanks — but they were sort of unlovely objects. They sat there humming and buzzing to themselves, and they weighed a ton. Besides, I loved my little grey typewriter, which I named Wanda June after the main character in a Kurt Vonnegut play. In other words, I was pretentious. (Was? Says a little voice in my ear, which I am ignoring). As time went by it became hard to find ribbons for Wanda June, or erasable paper, and I remember a brief dalliance with a Selectric. Then I started TAing, and began to hang around the University of Rochester Humanities computer lab. A Mac lab, but there were PCs too. As a graduate student I was entitled to a free copy of WordStar and a supply of discounted floppies — the big ones that really were floppy. Later I met my future husband’s nice little Mac: slide in a little square disc, with a satisfying click, and it would smile at you. And then you were writing, on a plump keyboard that made more pleasing sounds, by design, it turned out. I don’t even remember the name of that program, partly because it was so seamless, so unobtrusive. I wrote my dissertation on the Mac, and I still miss it — and I also miss my typewriter, which developed terminal mildew so that I couldn’t handle it without sneezing and getting nauseated. The only thing I couldn’t write on the Mac was poetry. I still needed the typewriter for that. Ok, so then on to Syracuse University, where after a few years as an adjunct in Textual Studies I picked up a second job as a tech trainer in a separate college, one with a serious computer lab, a beta site for Microsoft (although as my boss pointed out, the whole world was Microsoft’s beta site). They called me the “naive user,” because I didn’t use the specialized language the real techies did, and so I was less apt to find helping various people the age I am now an occasion for mutual apoplexy. So I was trained to help people with basic problems and refer the more complex ones up the food chain. I was also sent home with a desktop machine loaded with the new NT OS (which I promptly crashed and had to drag bodily back to the shop, to the great amusement of my very pleasant colleagues) and a copy of TechNet, a searchable DB on discs that listed all the many “issues” NT users were apt to encounter. TechNet came out every month, and most of the entries began, “This behavior is by design,” a phrase I still chant quietly to myself whenever I have an overwhelming urge to smash the toaster with the rolling pin (toasters hate me. My daughter’s equivalent of the Proustian Madeleine will probably be the odor of burning Whole Foods French bread). Thus began my familiarity with the bloated, beige world of word processing in the 90s. I also met a small, dispirited group of faculty who were hold-out users of WordPerfect, which they preferred because unlike MSWord it displayed formatting codes. Microsoft was too “locked down,” another irony for an Apple fan. At this point, the reader who has neither clicked elsewhere nor nodded off is no doubt wondering whither all this senile reminiscence is tending. My point, — honey, have you seen my specs? Oh wait, I’m wearing them. What was I — anyway, my point is that I have written on and tinkered with quite a few platforms, and had gotten used to the writing process involving sitting in front of a big beige or black box, a lot of waiting, a lot of screen clutter, a lot of useless options and defaults I needed to change . . . I took to the iPad at once, to its smooth surface and the ease of its screen. What I wasn’t sure about was how I wanted to write on it. I tried a stylus, but my writing is just too messy, too slow. So I bought an alarming number of writing apps, probably about thirty if you count the ones that claim to do everything. I have small fingers, so the on-screen keyboard is fine for me, especially in landscape mode, but then there’s even less room for writing space if you have a lot of functions. What I wanted was the feeling I used to get when I was a kid with a pen and a notebook, scribbling in corners. I found what is for me the perfect writing app quite serendipitously. At the advice of a smart colleague (thanks, Cheryl!) I had installed AppShopper and set it to hunt for discounted apps in the Productivity category. One day I saw one with a nice name, a literary name: Daedalus. The icon was attractive, too, clean black-and-white, a cursive D with an inviting lift of a virtual page at the bottom right corner. When I went to the developer’s site (I do not install anything that links to a cruddy site) I saw that my hunch was right: the title was an homage to my favorite author, James Joyce. So I pounced. That was a year ago, and five hundred pages. . . .
What do you need to know about this app? Well, it was designed by The Soulmen, whose other significant products so far include a more advanced word processor, Ulysses, which I mean to try when I get a Mac (sigh); a to-do list app; and what seems to be a very cool music player for kids, which I would install for my daughter were it not for the imminent risk of hearing “Call Me Maybe” another six trillion times. Anyway, I will at least consider any app this crowd designs, even if it involves directions for rotating the tires on a 1994 Volkswagen. Daedalus has just a few very smart features, including the ability to sort and stack “sheets” (documents), fool-proof export, etc. But the real deal, for me, is the way it works: tap once, and you’re writing. Swipe to change documents. That’s it (Ok, sounds too like a promo, but it’s accurate). It does other stuff too, but those are the important bits. Like a notebook, only I can read my own writing. And (cross fingers to avoid the anger of the electron gods) it doesn’t crash. I’m not the only fan by a long shot; check out the reviews. Oh, and I can write poetry on it. It just looks right. Ok, so that’s enough for one blog. Next: why I like a browser/writing app that does everything, including read things aloud in several accents, and where to find it. Also, why I like to make bubbles on my iPad . . . .
Technology is an expression of man’s [sic] dreams. If man did not indulge his fantasies, his thoughts alone would inhibit the development of technology itself. Ted Nelson is right: fantasy, dream, play are not trivial. To make technology our own rather than merely a corporate delivery method for goods and services, we must think useless thoughts, that is, philosophical ones rather than goal-directed ones. As Nelson points out about radio, when we have a goal and a medium we already have plotted a course, whether we are conscious of it or not. This works for language and thus for writing, which is why a relatively unstructured and fresh medium like blogging feels so liberating. When we speak or write we already know the end of the sentence, the goal of the text, even if we have not yet dragged it (sometimes kicking and screaming) into consciousness; language is thought groping towards itself, a recursive spinning back and forth across a gap of meaning which is rapidly closing. To imagine that we write with the whole thing already worked out in some other form (notes, outlines, whatever), to impose structure prior to content, is to run the process at half power, shutting down language’s potential to generate the new. How are we to identify the thing that makes language more than simple goal-directed behavior or empty imitation? We know that even small children make new sentences, and that language for them also is not simply about getting a cookie. Words are toys, rhyme and rhythm are pleasures, and some words even freak people out (what a powerful discovery!). There is in fact a term, one much in vogue in Europe and England a mere two centuries ago, when the printing press was churning out masses of stuff and some principle of selection was required. The term had been around, of course, and it had elitist connotations, but then so did computers at first. It was “wit,” and it was somewhat ineffable, although it combined humor, intelligence, literacy, and an awareness of manners. Wit also entailed a willingness to be a bit rude or satiric if that would change people’s perspective. And most importantly, wit might educate or satirize, but it did not demand to be taken too seriously. Ted Nelson’s style, with its broad reading and playful interpolation of other texts, its meaningful yet comic inversion (literally) of codex structure, its hybridity and call for change, is above all an example of wit in action. Hybridity is a fertile breeding ground for wit, since the interplay between forms opens up a space for shifts in consciousness, dual meanings, ironies, fresh perspectives. To return to one of my pet subjects, the medium we call comics is highly capable of wit because it is so very dual: the static image accompanies the linear word, exploring all the varieties of dual meaning. Comics are (obviously) comic, even when at the level of narrative the fate of worlds hangs in the balance. Nelson’s ethical high seriousness is not contradicted by his play with images, but cast into relief, enhanced, illuminated, made accessible — which is precisely his point; the more people “get it,” the more empowered we will all be. Unfortunately, US culture seems to have lost sight of the importance of wit. Most films based on comics have replaced playfulness with an ever-greater insistence on how very serious the whole thing is, or relegated wit to a string of obvious and cheap gags. The recent Batman films are so po-faced, so deadly earnest, that they manage to be simultaneously frenetic and deadly dull; the Ironman franchise, while less stultifying, suffers from the conviction that a lap dance is the font of all humor. The recent exception is The Avengers, in which Joss Whedon reminds us that good dialogue and playful action are always much wittier than sight gags and over-emphasized one-liners, and more true to the source genre (Stan Lee liberally peppered his creations with verbal humor, while Jack Kirby’s visual images were dynamic and fairly serious, but wildly stylized). Whedon’s movie is great fun, as (in a very different way) is Tim Burton’s seminal Batman, with its funhouse visual style and ironic dialogue. Both succeed because they are not afraid to break new ground, to be weird. And real comics, unlike films, are always weird, if only because the static image with its frozen, captive energies pulls against the forward motion of language, creating a psychological tension between Imaginary and Symbolic, fixation and dynamism, fantasy and clarification. Wit finds its home, its empire, in these hybrid media. As the events surrounding the appearance of this mysterious video demonstrate, how a piece of information is tagged for indexing and retrieval is more than simply a question of research methodology. The video represents itself as a trailer for a film, and as such it sidesteps YouTube’s definition of hate speech, which as Gupta points out is very difficult to define to begin with. In hindsight, it is easy to speculate that the intent of the video was precisely to cause violence and chaos, at a time when political transitions make for increased volatility. We are in an age of cyberwarfare, and propaganda is easily produced and distributed on a global scale. Given this risk, how can technological “speech platforms” identify potentially dangerous materials before they drop their terrible payload? And how can they distinguish creative and critical content from toxic waste? The problem of classification here is not merely one of locating offensive words, patterns of words, or even phrases; it is rather one of deriving meaning from a complex context. Human mechanisms for producing the effects of intentionality through distance media (print, video, etc.) have developed over the course of the modern era, but the only algorithm so far for detecting these devices is the human mind. And not just any mind — as Engelbart points out, it has to be a trained one. One way to see this process in action is to look at a very sophisticated verbal coding system, one with which many readers have difficulty: irony. I say readers because irony in speech is much more easily conveyed, by tone, facial expression, etc. But how do writers convey irony into the expressively depleted medium of text? For the purposes of simplicity let’s say that irony derives primarily from a kind of disconnect: something in the text is totally at odds with a deeper level of meaning. In dramatic irony, for example, the reader knows something that the characters don’t, which adds a layer of meaning. So when the hero of Graham Greene’s Ministry of Fear loses his memory, and with it the knowledge that he killed his terminally ill wife, his determination to find out the truth about himself becomes tinged with irony. We know that he wanted to forget his past, and that he will be devastated when he finds out. Another form, which we might call narrative irony, occurs when Dickens refers to a villain as a kindly old gentleman and an innocent victim as a young rogue. Our overall knowledge of the story tells us that Dickens is reversing the ethical polarity of the text, presumably to engage our passions on behalf of the victim and those he or she represents. In both of the above cases, decoding the ironic mode requires both rhetorical awareness concerning the tone of specific passages and a global comprehension of the text’s modalities. Both Greene and Dickens employ what is best thought of as a satiric mode, that is, a systematic set of tonalities that forces the reader to take a critical perspective on content. Readers trained merely to “relate to” fictional or journalistic narrators and characters, and those who are familiar only with argumentative modes, will often struggle to detect such sophisticated devices, and as a result will equate mentioning something with endorsing it. But readers who learn to read “against the grain,” to think through dissonance and ambiguity, will conceivable be more able to endure the existence of even serious dissent from their own views (thus the observed liberalizing effect of a liberal arts education). Irony and satire require a trained reader, and one whose training includes fictions rich in these modes. Recent changes to US standards for public education, which now emphasize non-fiction literacy, should be reconsidered in the light of this problem: literal-minded readers have no tolerance for irony, or for any representation that does not reflect their version of truth. The problem with Licklider’s analogy between machine and human language is that his definition of language appears to be based not on speech but on writing, and a very specific mode of writing at that: one that is in essence a set of directions. His analogy of the route reveals the heart of the problem. In a work of fiction, it is all about the journey, not the destination. Writing is a late development in human language, and a radically impoverished one in terms of the very important dimensions of context and tone. Not that writing cannot communicate context and tone; but in order to do so its user must have an advanced competence, an enlarged lexicon, and a rhetorical awareness. For this reason, until recently writing was an elitist activity: only a relatively small number of “power users” were capable of using it really effectively. Electronic media, I would like to argue, are at the same point of development as writing was in eighteenth-century Europe. We are still enmeshed in the eternal September that began in the nineteen nineties. Distribution mechanisms (in those days, the printing press and paper; today, devices and connections) may become less expensive and more accessible, but most end users are still relatively low-powered. They are newbies, not experts, in other words. The solution arrived at by the printed word was the invention of new delivery modes, journalism and the novel. These modes required a degree of literacy, but they did not require the writer to have the kind of education that at the time was only available to privileged males. Through print modes, writing developed a stylistic repertory that built upon rhetorical devices inherited from classical texts, while becoming demotic enough to be open to loan words and various dialects and dictions (many borrowed from the relatively vulgar comic plays of the day). Using the full lexicon of spoken Englishes, the novel and journalism became widely available as modes. However, writers were now dependent on printers (who also performed the roles of publishers), just as today’s electronic artists depend on technology designers and distributors. The printer who was also a writer could control his own work up to the point of distribution, although no copyright laws yet existed to protect the published text — and he was a he, because few women owned printshops. William Blake, printer and engraver, produced his radical and beautiful books in this way. But Blake was an exception in many ways, too radical for his own era. The market supported a typical capitalist solution: separation of the creative career from the productive, of the author from the publisher, while printer became for the most part a mere manual job. By the twentieth century, the codex had become highly uniform, illustrations and other hybrid manifestations had been pushed to the margins, and a normative discourse of “genre” ensured that journalism became mainly content-oriented and that truly creative novels like Finnegan’s Wake, texts that sought to broaden the options beyond traditional narrative etc., were oddities. The modes became fixed, and the novel was repeatedly declared dead even as it simultaneously became the most marketable and lucrative form of print object. How will electronic media solve the problem of widespread literacy and open creativity? How will they develop a rhetoric, a set of techniques, an access to mode of production, that will allow us to combine and remake electronic modes and tools, rather than simply using them? Or will technology remain either an elite object or a mere commodity, a tool for producing more consumable content?